Ah, Hatsune Miku, born to a Crypton Future Media on August 31, 2007. Her name means “Sound of the Future”. Now I’ve done some previous AtD’s on Vocaloid’s birthdays, but none more popular than the poster girl of Vocaloid herself. Since 2007 to now, the day of her 10th anniversary, the community has taken this girl and formed her into a social and economical icon for the Vocaloid community- as well as just primarily the Japanese nation as well. Nay, the world is reaping the benefits of this young lady. So how did Miku go from a simple V2 voicebank and thrusting Vocaloid itself into the mainstream? This is our discussion on this special edition of According to Demo. Miku’s 10th Anniversary! Miku was the first Vocaloid to ever have an official character. 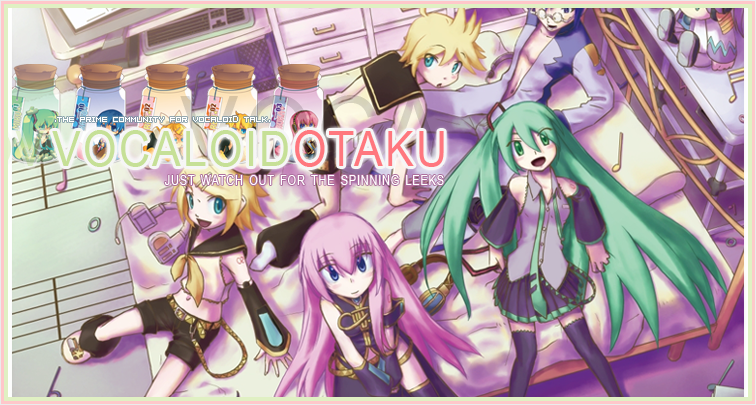 Her and many other Vocaloids of the Cryptonian type were commissioned by KEI. It took him over a month to actually draw Miku because he didn’t know what a Synthesizer was… it was because of KEI’s hair change that Miku ended up with pigtails. I remember calling her Twin Tails to Moma Haku, and she didn’t understand what I meant- but Miku won the 2000’s Iconic Twin Tail Award, next to sailor moon in the 90’s. You know those little hair pieces that just float up there… well, according to KEI, they are made of special material currently unknown to man… is he a prophet? Rather than Cryptons massive success by choosing smart people for the job, the internet made memes of her, as well as Hachune Miku, which garnered her character item a Spring Onion- not a leek, which is on my website logo. This lead to The Item War, and eventually died out- I honestly don’t know how to feel about that. This certain meme was so powerful, and so successful, that the sales of Miku shot up by thousands. But I’m getting ahead of myself. In the first 12 days, 3,000 sales were garnered, and CFM couldn’t keep up the production- it was like the Nintendo switch that I pre-ordered, then when I went to get it they gave it away… all in all, her entire first year went from 3,000 to 60,000 totaling up to 10 million dollars in USD- or 1.15 billion yen. Hatsune Miku has had stable fame since 2008 to now, but her using her Japanese name in many songs like you see on VocaDB, has declined her popularity to the point of it just being sad. Heh, poor Miku! Along With Cryptons happiness with sales, they opened up Piapro and Karen-T. We can’t forget those insanely expensive Miku figurines… And because of that, in 2014, Vocaloids collective goods department of Yamaha, totaled 73 million 800 thousand dollars… or 8.7 billion yen, of that year alone… Intensely underestimated by the music industry am I right? And with Miku’s Chinese Voicebank as well as last years V4 voicebank of Japanese and English, that number is expected to nearly triple next year, 2018. Now, we can’t talk about Miku, without again talking about Miku Miku Dance or MMD… Backing up a bit, a month after Miku’s release, CFM allowed people to create promotional material on their behalf. This lead to a number of 3d promos for Miku by many people using different programs. And people were excited, so they wanted to do their own, but couldn’t because of coding crap you gotta learn to actually do all this stuff… but February 24th, 2008, Yu Higuchi released MikuMikuDance as freeware. It was so simple, people started popping these things out like little Yuzuki’s, and this leads to the monthly MMD Cup on Nico Nico and YouTube, where the best video won. Many people including myself didn’t know Vocaloid was a vocal software when we came across MMD because I don’t know, I was 12. Neither a simple 3d video, a collection of literal millions flooded the industry and gave Vocaloid itself one hell of a boost. With the compliance of all of these things: The artist, the voice provider, the promotion, Piapro, Karen-T, Figurines, the concerts, Nico Nico Douga, YouTube, and as well as some memes with MMD and creators of all types. Miku herself is the poster girl of Vocaloid for one reason and one reason alone- DEMONS HAVE INVADED OUR MIND- no, no, it’s because the community themselves built her up to be what she is. The popularity can’t come from a few producers, it must come from people who enjoy her music, enjoy her image, enjoying just anything that she is a part of, all the way from the songs to video games to manipulating her into doing lewd stuff… she’s a cultural phenomenon, a person nonexistent other than in our hearts and minds… she stems from Japans culture and into our own- the promotion a synthesizer that hundreds of millions come to love. Hatsune Miku is the love of some people’s lives because she can give meaning to those who can’t sing, dance, or possibly even talk. As well as other Vocaloids, Miku just slingshot her way to the front, leading the fame of every Vocaloid, granting passage to her 10th anniversary is the things dreams are made of. Her image itself, backed by one voice, created by one company, and drawn by millions of fans. Vocaloid itself resembles Miku’s being, and people are beginning to figure that out on a world scale. Miku is the Diva in our hearts, moving many to do things they’ve never before done. Miku and Vocaloid is an idol that can be molded by the people, for the people, and not held down by any restrictions other than copyright laws… Giving people a sense of purpose and prosperity since August 31st, 2007 – August 31st, 2017… Happy Birthday, Hatsune Miku, we love ya, sis!